The August 2012 issue of Marie Claire is all about simple, fresh beauty tips. Discover the newest in hair care and cosmetic products, as well as what’s trending in the beauty world right now. 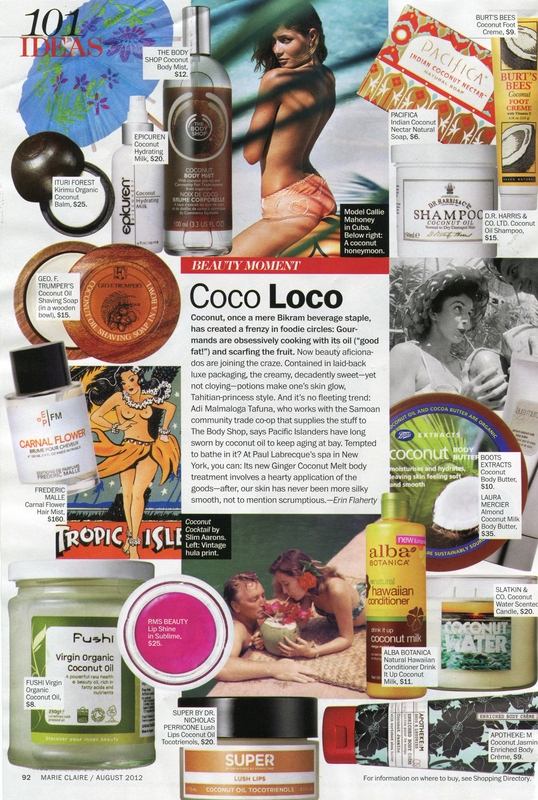 Leaving sun soaked beaches and diving into an array of cosmetic products, the yummy coconut is finally having its very own beauty moment. From hydrating lip balms to nourishing hair creams, this super fruit is making its mark on all kinds of goodies. So which rms beauty item is Marie Claire going coco for? Our moisturizing lip shine of course! Full of raw, food-grade coconut oil and the miracle moringa oil, our lip shines provide nourishment to lips while still packing a serious color punch. Choose from three distinct, glossy hues: the petal pink bloom, the earthy moment and our newest addition, the vibrant fuchsia-colored sublime. Pick your potion–we promise it will be your newest healthy addiction!